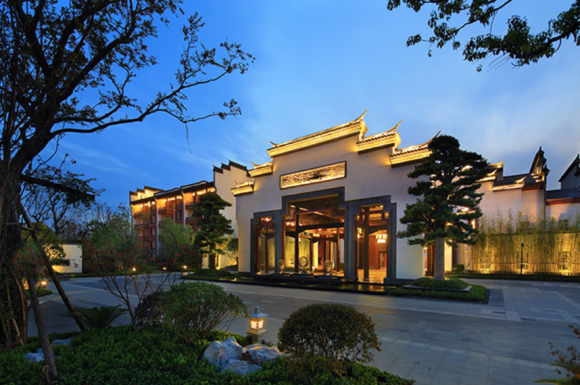 HEFEI, China—The Wanda Vista Hefei, located in Binhu New District of Hefei, China, is a luxury, five-star hotel known for its elegant atmosphere, traditional Huizhou architecture and harmony with “Hui” culture. In addition to 205 private rooms and suites, the hotel features a lobby, 4,900-square-foot banquet hall, eight conference rooms, restaurants, fitness center, swimming pool and spa. In order to provide audio coverage for such a wide range of areas with different functions, the hotel hired Shenzhen Hongzhe Intelligent Systems Engineering Co., Ltd. to install a complete HARMAN AV solution consisting of JBL Professional speakers, Crown amplifiers, AKG microphones, BSS audio processing and AMX AV systems. The sophisticated HARMAN AV system allows the Hefei Wanda Vista staff to produce a wide range of successful events. An AKG WMS470 wireless microphone system provides smooth and intelligible speech in the grand ballroom and meeting spaces. Utilizing a BSS PDP-DSP public address processor and CobraNet network, audio signals are routed to Crown CTs Series amplifiers and configured to combine (or isolate) the speakers in each room or zone. Operators can discretely make volume adjustments in each meeting space with BSS BLU Series control panels. For convenience, an AMX NX-3200 central control panel enables remote control of all AV equipment using a wireless tablet.